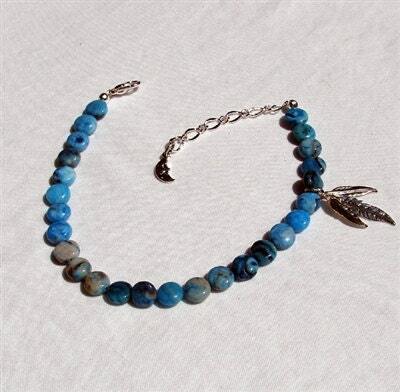 Larimar Blue Agate Anklet with Silver Feathers. Small coins of Larimar Blue Agate with the addition of three silver feathers create a very unique anklet design. Dramatic blues draw the eye and the light feathers drape over your ankle when the chain is worn at the heel. Length is nine inches with a two inch adjuster for a total or eleven inches.